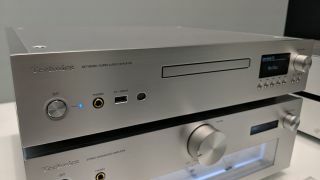 Technics reveals SL-G700 SACD player and network streamer | What Hi-Fi? The network universal player is set for launch by March next year. Technics has a new addition to the Grand Class range on the way - the SL-G700 network / Super Audio CD player. The prototype machine is on display (somewhat undercover) on the Technics stand at IFA 2018 in Berlin. Details are thin on the ground but we managed to tease out some information on the product, which is due for release around February/March 2019. The universal player builds on the work of the G30 amplifier and streamer, launched back in 2015. The new network player promises an increase in amplification power and a thoroughly upgraded set of streaming features, with AirPlay, Bluetooth and Google Chromecast all set to be on board, giving access to music from Spotify, Tidal, or any other app you might care to use. There's internet radio, too. There's SACD playback too, with Technics still seeing plenty of demand for SACD discs in Japan (and the UK), and the promise of MQA and hi-res audio support. The rear of the unit shows balanced and RCA audio outputs, optical and coaxial input and outputs, and an Ethernet connection, while the front fascia has a USB and headphone connection. Technics' trademark sleek design remains, with the thew SL-G700 streamer sitting pretty next to the SU-G700 amplifier (complete with eye-catching VU meters). Due on sale in February/March next year, the streamer is set to cost 2500/3000 euros.